Clemson defeated Alabama in the National Championship 2017 and now intends to enter the NFL 2017 Draft. The Monday night game will be remembered for a long time due to various reasons. The match of this competition is being compared with Longhorn legend Vince Young’s game-winning touchdown run in the 2005 National Championship against USC. Tigers quarterback Deshaun Watson side Clemson clinched a 35-31 victory over No. 1 Alabama. Watson said that the legend Vince Young was running through his mind throughout the game. The comparison between them is not just a co-incidence. Watson racked up 420 passing yards and four total touchdowns. Watson, the Georgia-native said that the Texas gave him the inspiration to win the cup and give a match-winning performance. Watson told us about the Vince Young thing as well as that he wanted to be like him. Young was one of his greatest players that he loved to watch. 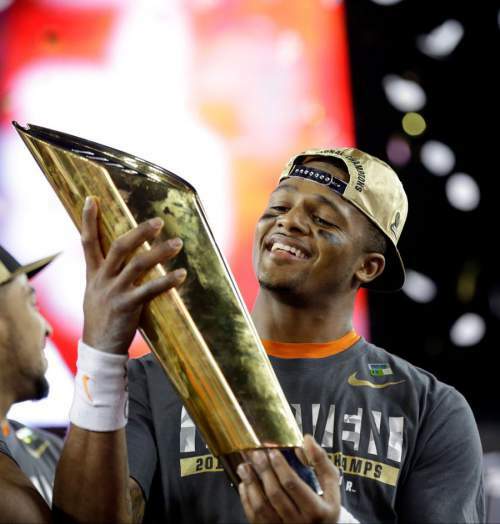 Watson said he was in the fifth grade when Young won against the Trojans and made Texas win the fourth title. Despite that, both of them have a lot in common. Both finished as Heisman runner-ups in their season. Both took a title and all-time memorable moments. Further, he said that he intends to enter the 2017 NFL draft. He stated the following regarding it. Along with Watson, three other Tigers are going to apply for the draft as juniors – Mike Williams, Artavis Scott, and Wayne Gallman. However, Watson hasn’t fully settled on the decision yet. So far in this season, he has completed 388 of 579 passes (67 percent) for 4,593 yards, 41 touchdowns, and 17 interceptions. Two of his performances were noteworthy against Alabama’s defense were remarkable: 66 of 103 for 825 yards, seven touchdown passes, and only one interception. He also rushed for 116 yards in those two games.